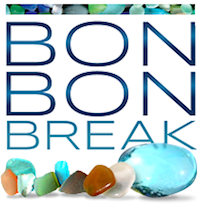 This is a guest post from Lou of the amazing blog Mommy Sanest. The original version appeared on her blog, and is re-posted here with permission. Even though the second week of March brought temperatures in the 50s to Chicagoland (hooray! ), I’ve lived here long enough to know that winter may not be completely behind us yet—and spring in the Midwest will bring plenty of rainy days. As the parent of a toddler, I have learned to get creative when coming up with new ideas to get us out of the house when our go-to outdoor activities, like the park or zoo, aren’t an option. The next time you’re stuck inside and have exhausted your toys, crafts, activities and resources, try one of these unexpected places to take a toddler on a cold or rainy day. This is an obvious one, right? Keep in mind, even if it’s not story time, most libraries have moved beyond shushing and have interactive children’s sections with toys, blocks, computer games and, of course, books. Check out libraries in nearby towns and give your little one a chance to explore new spaces. Indoor malls often have small play areas for young children—usually small climbing structures, and they are usually free. Some malls also have paid attractions, like train rides or small carousels. And, if your little one is still content to hang out in the stroller, malls are a great indoor space to get some walking in when the weather outside is frightful. I used to dread the idea of getting through Ikea with my toddler, but then I realized that the children’s section is set up to entertain the kiddos. The last time we took our daughter to Ikea, she couldn’t get enough of the toys that were available for her to test out. 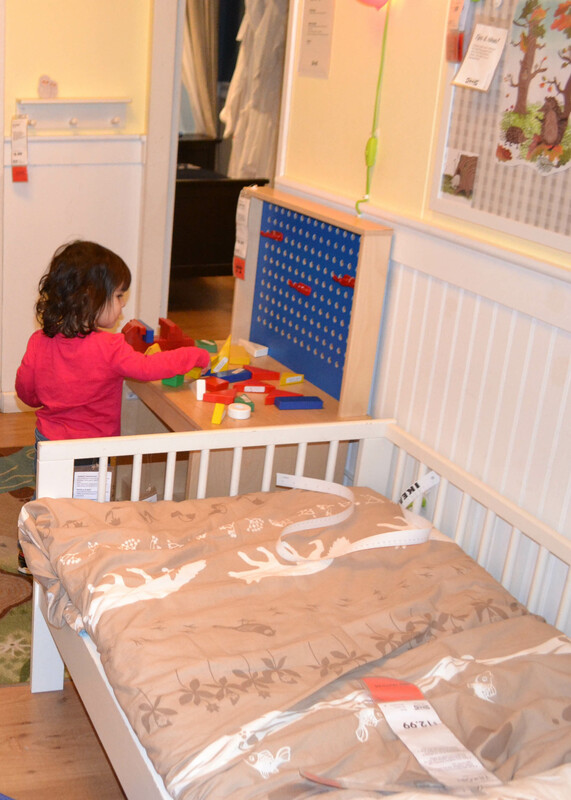 She loved exploring the staged children’s rooms with their toddler-sized furniture too. Find an Ikea location near you. My daughter (and every other toddler I know) loves to look at fish and animals, so if the zoo isn’t an option, we head to our local pet or aquarium store. Just be careful with any loose animals, and stay away from places where people can bring their own dogs, like Petsmart or Petco. Stick with fish and other cage-bound pets like lizards, hamsters and guinea pigs. I’m not excited about getting my toddler hooked on Big Macs, but I can’t deny that sometimes a McDonald’s Playplace, which is basically just an indoor climbing structure, is a literal lifesaver. Playplaces are separated from the rest of the restaurant with a seating area where mom and dad can relax with their McFlurry (what… just me?). We also plan road trips around McDonald’s Playplaces because they give our daughter a chance to burn some energy after a few hours in a carseat. Use the location finder to see if there’s a restaurant with a Playplace near you. Most YMCAs and park district recreation centers offer an hour or two of free or cheap babysitting services in a daycare-like setting for parents. If you’re a member, I highly recommend you take advantage of this perk from time to time. In addition to babysitting, most of these centers have spaces you can use to burn some toddler energy even if there isn’t a specific program going on. If it’s a slow time of day, ask if you can take your child into the gymnasium, a vacant fitness studio or onto an indoor track. If your center has an indoor pool, check open swim times. Conservatories and greenhouses are great options when little ones who love dirt and plants can’t go outside. Plus, they have the added benefit of helping you forget that the weather outside is cold and dreary. Many conservatories even offer programs for young children and families, which are a great way to engage budding horticulturalists with hands-on learning. I am a huge fan of indoor play spaces and play cafes, and they seem to be popping up in a lot of towns. Unlike businesses that offer indoor inflatables, these spaces cater to the toddler and preschool set with age-appropriate toys, climbing structures, dress-up clothes and more. Better yet, your 2-year-old won’t be demanding to get into a bouncy house with a dozen kids three times his age. Indoor playgrounds are also a great option for weather-proof fun. I’ve noticed that more and more park districts and recreation centers are offering indoor playgrounds (or even play spaces) for kids. If there isn’t one in your town, check nearby cities—it’s usually only a few dollars more for non-residents to play. Children’s museums are always a great option, and we love our local children’s museums. 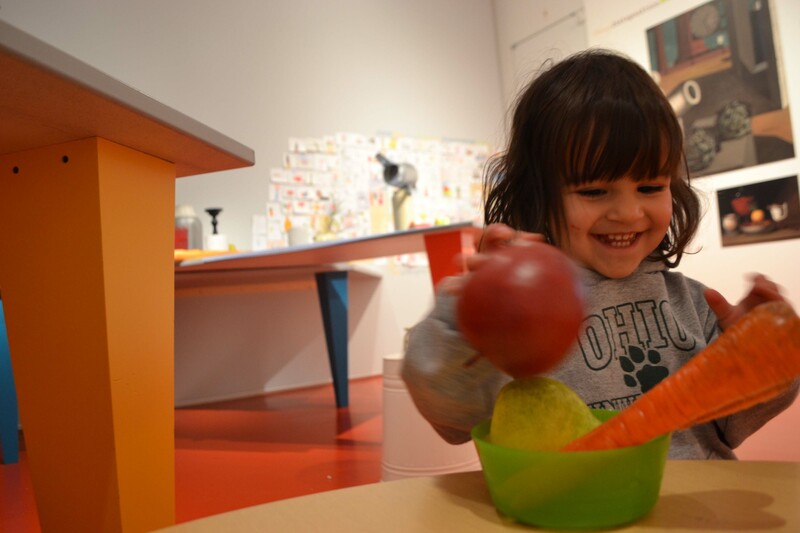 But think outside the children’s museum box: Art, history and science museums often have sections that cater to little ones—and depending on your child, you may be able to tour one or two of non-kid exhibits. We take our daughter to the Art Institute of Chicago regularly, and she loves it. Check websites or call for information about the kid-friendly features of museums in your area. Yes, I see the downside to taking your young child to a toy store! Some shops even offer in-store events where kids can do crafts, create art, or listen to a story. Don’t feel like you have to buy something every time you go—just remember to support your local store when it’s time to shop for holidays and birthdays. 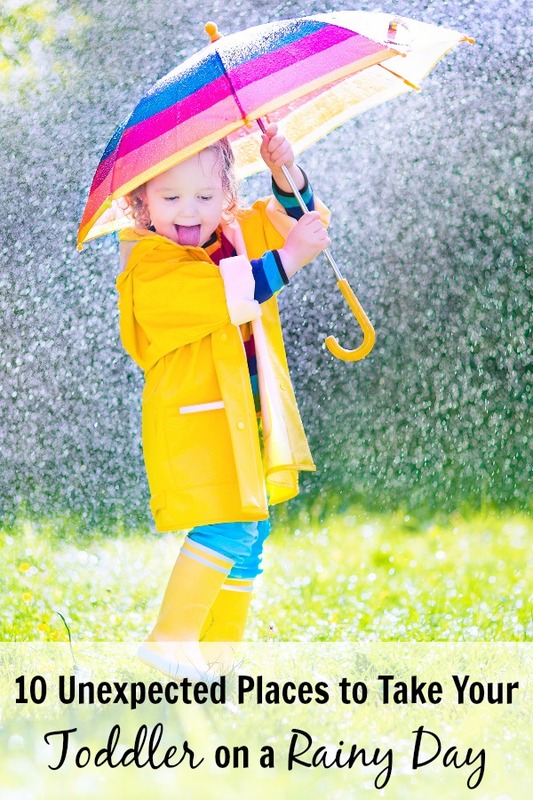 Where do you take your toddler on cold and rainy days? Lou Fitzgerald is a freelance writer, digital content strategist, and recovering marketing professional. She’s the mom to one toddler-aged daughter, wife to a police officer husband, and owner of a rescued lab/collie mutt who regularly drives her crazy. Check out her blog Mommy Sanest, and be sure to follow her on Facebook, Twitter, Pinterest, and Instagram. My kids are older now, but yes to all of these! I remember we would go to the local bakery, too, and sit by the front windows. It was right on a main thoroughfare in town and my son *loved* watching the 18-wheelers go by. These are good reminders. We have several little depots here where the kids like to go and wait for the trains to come in. My daughter liked to go to the florists and pick out a flower to take home! Thank you so much, Katie, for including my article on your site today! I love hearing these other ideas. The florist is a great one! And my daughter loves trains as well. We have an indoor waiting area at our commuter train stop that is literally steps from our house. I never thought to hang out there with her! Thank you so much for being here! It’s an honor! This is a great list of inspiration for the summer months for us in Phoenix! I like taking my girls to the local Oriental supermarket (we have a huge, awesome one). So many fun foods to be curious about and try! My girls love getting to choose an unusual fruit or vegetable from the produce section, and they’re always excited to try it because they picked it out. We’ve found some atypical family favorites that way! Sounds like a blast and great culinary education to boot! We love our local library! But Ikea, McDonalds, and the mall are also easy and cheap for us! I always loved to go to the library! I never thought of IKEA, but then again I’ve never been in one so I don’t know how cool they are. Library? Check. Mall? Check. Also—Bass Pro Shop. Yes, we’re in the midwest. Yes, our 2.5 y/o son loves looking at the big fish tank and clambering about the ATVs and the boats. #1 and #4 are two of our favourites. We are heading to the library today! Life in the PNW, on the coast, in a small town, means we live this post, except we don’t have many of the places mentioned. The fabric and hardware stores are great, too. The learning there is immense and we know almost everyone there, so Susanna receives tons of attention and socialization. Love the idea of going to fabric and hardware stores! I’ve never done that with Luke before. These are some great ideas! We don’t have an IKEA, but all the other ones would work. We have a wonderful children’s museum that is only a few bucks to get into. Thanks for sharing these ideas! Would love to have you link it up with us: http://trueagape.net/2015/03/monthly-motivation-link-up-v-1-i-3/ Open until Sunday at Midnight. Love these ideas, especially IKEA! The first two are our go-to spots, for sure. We also like museums (though those can also be tricky since rare is the museum with zero outdoor space). 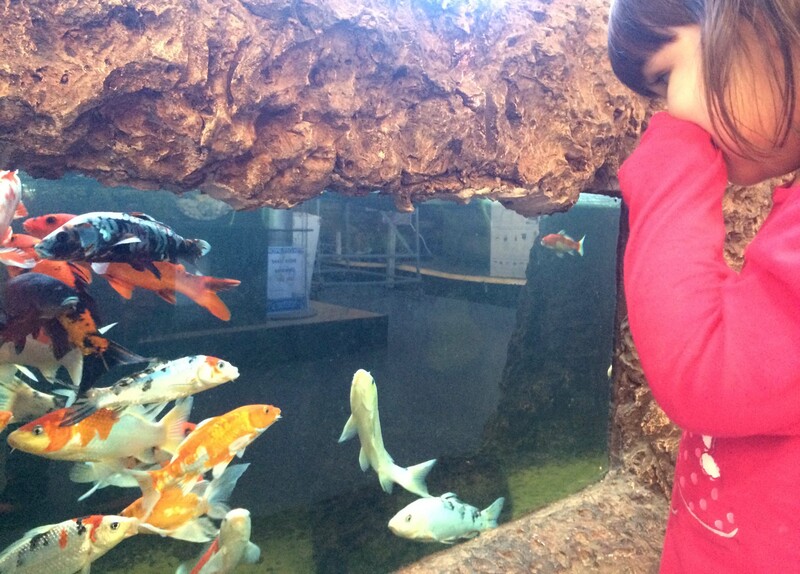 Science and aquarium locations are also big hits with my kids! The pet store is always a hit for us! McDonald’s play area is a fave for my daughter, but my son won’t play unless there aren’t any other kids there. Some great ideas of places to go!